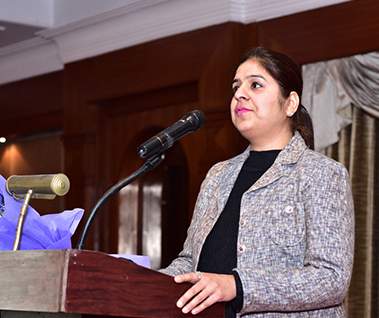 Mrs.Sanmeet Kaur, Founder Of Sunson Trainings is a leading Motivational Speaker ,Corporate Trainer and a Life Coach. She has an experience of more than 15 years in the Corporate Sector, where as she is Counseling/Coaching people for the last 12 years. Over the years, Sanmeet Kaur has helped more than 50000 individuals to understand their personal & professional strength & help them to identify their week are a and improve them. Through her Seminars she makes her participants realize their strength and how it can be used to achieve their goal and success. She has done Masters in Human Resource and Marketing and she is fond of learning new things. She creates energy in the training room and participants remain enthusiastic throughout the program through her experiential form of training. Driven by her passion to connect with her audience, she delivers powerful messages in her session resulting into empower them her passion to make powerful change in individual life, lets her chose to become a Motivational Speaker and a trainer. She has conducted many open house as well as in-house training programs on various topics related to behavioral training, marketing and sales as well as soft skills training. She is competent in creating an impact on the participants and takes them through a reflective mode of thinking. She is associated with a number of Corporates, Management Institutes, NGOs, Govt. and Semi Govt. Depts.